What is Colour Blindness and What Causes it? Anomalous Trichromacy: all three cone types are used to perceive light colours but one type of cone perceives light slightly out of alignment, so there are 3 different types of effect produced depending upon which cone type is ‘faulty’. Dichromacy: only two types of cones which are able to perceive colour (i.e they have a total absence of function of cone type). 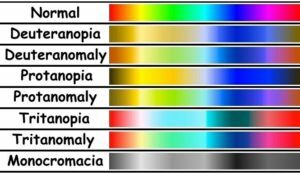 Lack of ability to see colour is a good way to explain this condition, but in fact it is a specific section of the light spectrum which cannot be perceived. Anomalous Trichromats: Deuteranomaly (green-weak); green sensitive cones are not missing in this case, but rather the peak of sensitive is moved towards the red sensitive cones. Tritanomaly: functionally limited blue cone cells. Blue appears greener and it can be difficult to tell yellow and red from pink. Tritanopia: blue-yellow colour blindness, lack blue cones cells. Blue appears green and yellow appears violet or light grey. How is Colour Blindness Diagnosed? Cambridge Colour Test: uses a visual array similar to the Ishihara plates, except displayed on a computer monitor. Goal is to identify a C shape that is different in colour from the background. D-15 Test : based on a set of coloured plates or discs which have to be arranged in the correct order. Colour blind people will have difficulties to arrange the given colours and make mistakes. Can Google Predict Cardiovascular Risk from an Eye Scan? Verily Life Sciences developed a software which scans the individuals eye and can determine a host of cardiovascular risk factors for the person. Google’s AI was able to tell with 70% accuracy which patients had recently suffered from strokes by analyzing the appearance and diameter of the retinal blood vessels. 250 – 5215 Finch Ave E.
4110 – 419 King St W.